An interesting thing happened last week at 10,000′. As I quietly spun at 90 rpms climbing over the top of Loveland Pass I checked over my shoulder to see my riding partner several hundred meters behind me pumping furiously to catch up. Having been lost in the ride, I had not been checking any vitals during the climb. Simply enjoying the day, the ride and my bike, I was completely unaware of my heart rate and effort level. A quick glance at the Garmin showed what I suspected….I was hardly trying. The post-ride beer and ride discussion inevitable turned to my performance on Loveland Pass. My riding partner wanted to know what heart rate zone I was climbing in. I didn’t have the heart to tell him that I was comfortably in Zone 2/Zone 3 the entire climb with nary a glimpse of tipping into the anaerobic zone and max efforts. I shrugged it off to “good legs” and out of generosity, switched the subject to training. My riding partner assumed I had logged thousands of miles and hundreds of hours. My stats told a different story: just 67 hours in the saddle and only 1,000 miles under my belt for the season…hardly worthy of note in a sport that requires thousands of miles and hundreds of hours to be in peak shape. In comparison, my riding partner had logged closer to 1,500 miles and well over 100 hours. My secret? I trained smart with the little amount of time I had. The birth of my daughter in late Spring took priority and I found myself struggling to dedicate even a few hours on the bike per week. 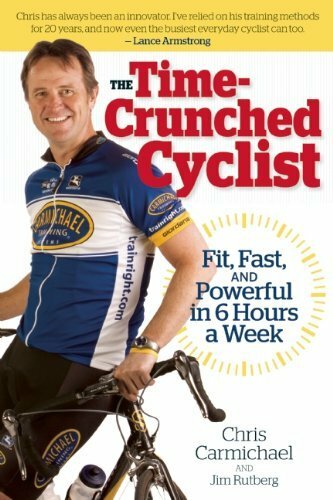 To maintain sanity at home (by spending more time with the wife, baby and two young boys) and my sanity (by finding time to ride) I followed Chris Carmichael’s training regime outlined in The Time Crunched Cyclist. The only thing worse than being forced to train indoors is being forced to train indoors without the following 5 must haves. Your gonna sweat buckets. Keep those buckets of sweat from ruining your sweet ride. Not only is sweat gross, it’s also highly corrosive. As an added bonus, it comes with a handy pocket organizer to hold your TV remote control, iPod, Clif Bars or whatever you might want handy. Sure, you could save a few bucks and try to cover your bike with a towel…you could also save a few bucks and buy some cycling shorts w/out a good chamois. Get a fan, any fan. Not a flag waiving, allez shouting, costume wearing fan-atic but an electric, bladed device capable of pushing volumes of air in your general direction. A properly positioned fan will keep your buckets of sweat from turning into bathtubs of sweat and will ultimately prevent your heart rate from climbing higher than the Schleck brothers. We’re big fans (badump *clang*) of a pedestal, high velocity fan like this Lasko Oscillating High Velocity Fan. If you don’t already have them, get them. If you have them, use them. Remember the buckets of sweat we keep referring to? When training on an indoor cycling trainer, you must focus on staying hydrated. For cyclists new to the sport, time spent indoors on your bike can help you to not only perfect your pedal stroke and learn more about your bike, it’s also a great time to master pulling the water bottle from a cage, popping the nozzle and drinking without losing cadence and without looking. It is not however, a good time to practice blowing snot rockets. Sure you can find the occasional road cyclists who absolutely loves climbing; however, we contend that every road cyclists loves descents. That said, nobody enjoys the downhill descent position that a fluid trainer inevitably forces you and your bike to assume. The simple solution? Well Einstein, you’ve raised your rear wheel anywhere from 2 – 4 inches, maybe you should raise your front wheel the same height? Good choice. Once again, you could plant your front wheel on a couple books, a block of wood, etc. but why risk ruining book 2 in the Twilight series and why risk ruining the perception that you’re some sort of road biking pro? Pick up a wheel block. Stay pro. As road cyclists, it is our duty to maintain not only our hard-earned stamina but also our well-earned sensitivity to temperatures below 45 degrees. Enter the indoor bike trainers. A necessary evil in the fight against cycling sloth. This trainer features a new larger flywheel with twice the inertia for an improved, road-like feel. The power-band technology offers the widest resistance range–from easy spins to lung-burning climbs–without ever touching the unit. The infinite resistance curve ensures increased wattage as you increase speed for realistic statistical analysis at the end of your ride. The Fluid 2 is surprisingly quiet, and the self-cooling mechanisms–including a patented fan design–keep the unit performing better, longer. Kinetic Fluid Trainers are equipped with the heaviest flywheels available, ranging from a solid 4.4 pounds to a massive 18 pounds. The result is an ultra smooth, road-like ride without altering the force curve. So every acceleration and coast down delivers the experience of riding outdoors. With the trapezoidal leg design and the largest footprint of any trainer, Kinetic Fluid Trainers keep power and motion focused on the flywheel. So even during hard, out-of-the-saddle pedaling, the ride remains rock steady. Conveniently, the Road Bike Mike office was split between devout CycleOps fans and diehard Kurt Road Machine fans. With literally thousands of training miles logged amongst our staffers and their ‘beloved’ indoor bike trainers, we didn’t need to look far for opinions. The Blackburn was a wildcard having no support or familiarity for the RBM crew. We dug deep into the corporate coffers and put together a couple hundred bucks to buy the Blackburn Tech Fluid Trainer and give it a go. The recent spat of nice weather in our Denver offices afforded our staffers some real road time and our nominated trainer reviewers some quiet, intimate time with our 3 indoor bike trainers. The results were none too surprising. Like butter baby! Whether revving to 100+rpms or cooling down at 70rpms the CycleOps is smooth and quiet. Hard to believe this trainer has over 3,000 miles…that is until you look down at the roller wear and sweat stains. No risk of pulling a Christopher Reeves…this thing is solid when jumping out of the saddle. SBD. Silent but deadly. Training on the Kinetic will leave you all along with your thoughts…which are usually focused on the screams coming from your quads. F*#k the Beach Boys and f*#k the Blackburn…these vibrations are not good. Conclusion: Road Bike Mike Likes anything but the Blackburn. Seriously. You can’t go wrong with the Kinetic or the CycleOps. Based on our experience, you can go severely wrong with the Blackburn. After you pick up the CycleOps or the Kinetic, be sure you’ve got the 5 Must Haves for any indoor training session.